Strikeflier is a winged samurai-like Bakugan. 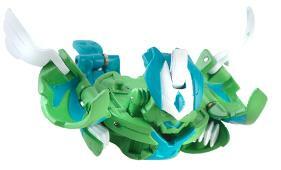 He is the Guardian Bakugan of Airzel in Bakugan: Gundalian Invaders. Strikeflier is partners with Airzel of the Twelve Orders. He absorbs specific skills of an opponent's ability, and combines them to strengthen his own. He creates a freezing wind that immobilizes his foe. He also can generate ice and snowstorms from his hands and uses the ice crystals to attack his opponent. His main Battle Gear is Battle Turbine. Its Pyrus version comes in three variations, 750 Gs in the BakuBoost, 800 Gs in Crimson and Pearl, and 710 Gs in the Gundalian Invaders BakuBowl Arena. Its Subterra version comes with 600 Gs in the BakuTriad and 630 Gs in game packs. Its Haos version has 770 Gs in BakuGranite and 740 Gs in BakuBoost. Its Darkus version has 630 Gs in the BakuTriad, and 730 Gs in Bakuboost. Its Aquos version has 680 Gs in the Aquos BakuTin, another aquos version can be found in the Bakuboost with 800 Gs. Its Ventus version comes in three variations, 750 Gs in the Combat Set and 780 Gs in the BakuBoost, and 660 Gs in the BakuTriad pack. It's Clear version has 730 Gs. Purchase your Strikeflier from Amazon now!